The Green Monster at Boston's Fenway Park has some Morse on it that no one ever notices. 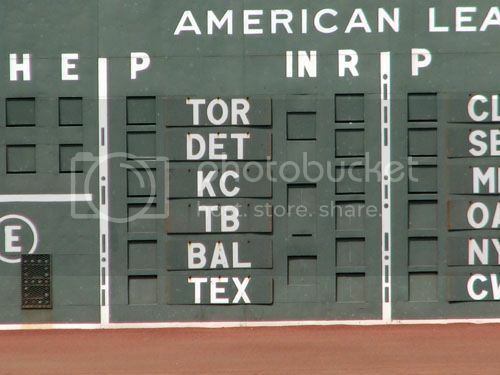 The next time you watch a baseball game being played at Fenway Park in Boston, look carefully at the white lines in the scoreboard on the left-field wall. You’ll spot some dots and dashes hiding in plain sight in two of the vertical stripes. They spell out “TAY” and “JRY,” for Thomas A Yawkey and his wife, Jean R Yawkey; the Yawkeys were co-owners of the Red Sox for many years. I know there are lots of other examples around the country of messages in Morse hiding in plain sight. Post them here! Edit: Oh yeah, in case you weren't aware, my Boston Red Sox are playing the World Series right now . The next game at Fenway is Wednesday (10/30) at 8:00est. Try this one (click to embiggen once you go to the link). it's a message from the newest member of the national security team. Anytime I try to read code visually all I see is random dots and dashes, I literally have to sound out dits and dahs in my head and then I instantly recognize it. More proof positive that code is an aural and not a visual language. Zoom in. I can easily make out the dashes. I have to use my imagination to see the dots, but knowing the message I can get most of it. Cute idea but it looks like they didn't put any spaces between characters so it would take a cryptographer to figure it out. I'd argue that without spacing it's not even Morse Code at all, just random undecipherable dits and dahs. Of course I'm guessing they did it for it's "artistic statement" and not for us hams who are actually fluent in an "obsolete" language.